A lot of businesses perform well in good times not because of their strategies but because of market demand. Most Malaysian companies have strategies but many of them do not assess and align the established strategies with the changes in market condition. They use their past success as an indicator of what they should do in the future. Even though many of the old beliefs and tactics of the past have brought them to where they are now, it is not enough to bring them to where they want to be. In fact many businesses fail because lack of structure plan in order to transform their business according to the market demand. Many of us perceive that strategic planning is only applicable to the multi-national corporations or listed companies that are worth millions of dollars. In fact, every business should incorporate strategic planning as part of the each company's core process. 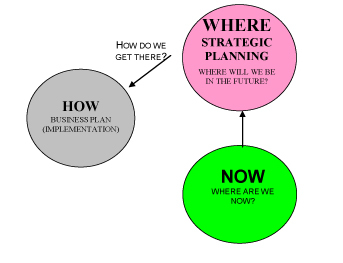 Is strategic planning a complicated activity? With a proper structure, strategic planning will become a comprehensive yet simple activity. By involving the key management of the business for just 1 day, our firm's strategic management program enables us to create a tailor-made strategic plan for your business. This strategic management program is applicable for all types of businesses and industries. Many companies including trading, manufacturing, service providers and restaurants manage to find their direction and align their existing strategies by having this one day program. This section encompass steps need to be taken by the Management to identify their strengths weaknesses, threats and opportunities for their business. They also need to recognize their core competence or competitive advantage. We realized that many key management are not aware of their competitors in the market and their market share in the industry. Many of the business reach a point where they find themselves facing difficulties and dilemma in expanding their business. In this stage, the key management will identify vision, mission, objective and their five years financial target. We will coordinate with the key management to establish an organization action plan and strategies in order to accomplish the established objectives, mission and vision. This stage is important in the program, because studies indicate that almost 70% of the businesses fail to execute their strategies.